It is also recognised that to meet the limit values of Stage IIIB/4i, it is anticipated that engines will have to be equipped with some form of particulate filter, which is currently only available for a select number of new piling rigs. 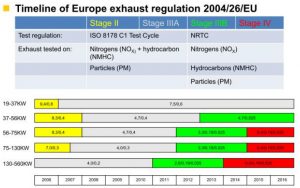 Furthermore, in accordance with Directive 2004/26/EC, an equipment manufacturer may use the ‘Flexible Scheme’, which allows them to purchase engines from their engine manufacturer during the period between two successive Stages that do not meet the requirements of the current Stage but comply with the previous Stage (Stage IIIA/3b/4i). Over the past two to three years, a number of clients have been specifying the use of Stage IIIB/4i engines in equipment. At present, only a limited number of FPS members have piling equipment with engines that meet the limit values of Stage IIIB/4i, however, they are being requested to modify existing engines and equipment to meet the limit values of Stage IIIB/4i. Piling rig manufacturers are experiencing difficulties with this request, in fact, several of their engine manufacturers have stated that any modification to existing engines to enable them to meet the limits values of Stage IIIB/4i may not be approved. Engine manufacturers themselves are experiencing difficulties in supplying engines within certain power ranges that meet with the 4i / 4 final requirements. Each category of engine is specifically designed to produce a specific power output and any modification without further investigation, design and analysis will inevitably result in problems, such as an increase in exhaust back pressure, which could cause a catastrophic engine failure. Under the ‘Flexible Scheme’ new equipment may still be provided with Stage IIIA/3b engines. Any modification to the engine/equipment to meet the limit values of Stage IIIB/4i, which is carried out by a FPS member will not currently be approved by either the engine or equipment manufacturer, who are ultimately the design authority. Until the above issues are resolved or time has elapsed to the point where a Stage IIIB/4i engine has to be used, clients are requested to afford FPS members dispensation when meeting the limit values of Stage IIIB/4i for existing engines and equipment.